Yeehaw!!! Cowboy’s for Trump rode into D.C.
Coverage of the ride starts about 2:10. I have to say, it seems that protesters on the right generally have a good sense of humor and a positive outlook. 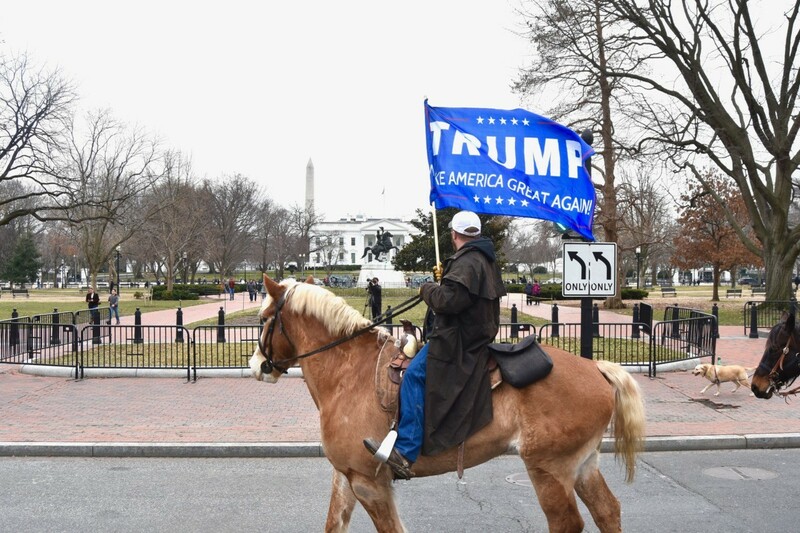 D.C. Police escorted men and women on horses through the streets of the nation’s capital on Friday as Cowboys for Trump and a last-minute Native American rider rode in support of President Donald Trump and his efforts to build a wall on the U.S. southern border with Mexico. Some on the sidewalks cheered while others jeered as police escorted the more than a dozen riders carrying American and “Trump Make America Great Again” flags through downtown and past the White House. Most of the Cowboys for Trump came from border communities in New Mexico where they said drug and human trafficking is rampant, and Trump’s national emergency declaration is essential to securing the border and protecting the American people and the lifestyle we enjoy. “We’re riding to defend the lives of the brave men and women of the Customs and Border Protection because they need a physical barrier, technological infrastructure and human capital to be able to do their jobs every single day,” Clarkson said. This entry was posted in Current Events, Illegal Immigration, Law, Politics, Refugees & Aliens, Uncategorized. Bookmark the permalink. 7 Responses to Yeehaw!!! Cowboy’s for Trump rode into D.C.
What impresses me is how friendly and happy these people are. Then there are the nasty ones yelling, giving the finger, etc. I think every Trump supporter I know is like this.